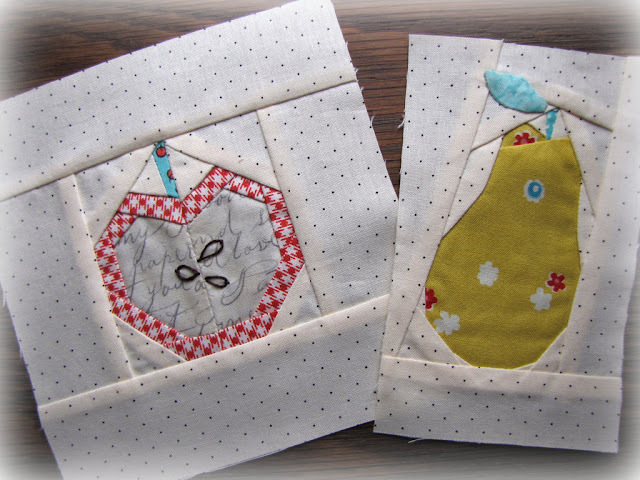 I've been working on writing a paper piecing pattern for the apple and pear. I hope to have them up on my blog for free as well as a tutorial. I'll keep you posted! I'm doing this as a practice run for a more complicated pattern I'm working on. In other holiday related family news - we got our xmas tree on Sunday. We started a new family tradition a few years back and drive to the mountains to cut down our tree. Every year I underestimate the size of the tree we cut down. This year I thought we found the perfect size tree but once we got it home we cut off another 3 feet! The apple and the pear look yummy! A tutorial would be great!